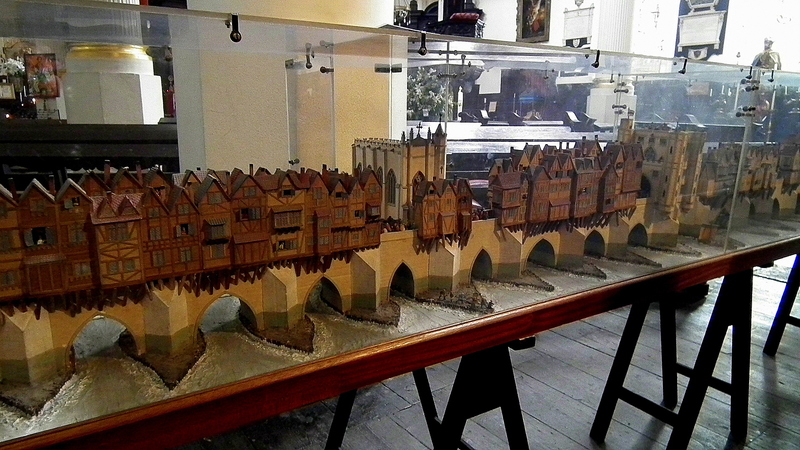 Prior to the early 13th Century all structures crossing the river Thames into the city had been made of wood. Several were lost to fire and conflict, such as in the all consuming fire of 1136 and previously in 1014 when Anglo-Saxon king Ethelred sailed up the river with Norwegian king Olaf’s Viking fleet. The allies pulled the bridge down to divide King Canute’s occupying Danish Viking force. The nursery rhyme “London Bridge is falling down” is thought to derive from this event in the bridge’s history. The legendary Bridge took more than thirty years to build, it remained the only crossing into the old city for 560 years and stood for 656 years. Completed in 1209 Old London Bridge comprised 20 piers, 19 made of stone. The single wooden pier included a drawbridge to allow ships to pass, whilst the largest The Great Pier housed Thomas Chapel, regularly visited by pilgrims en-route to Canterbury. Maintenance money for the bridge was managed by Bridge House Estate. They received revenue from a Toll, collected at the southern bridge entrance and also from the considerable property rental charges. 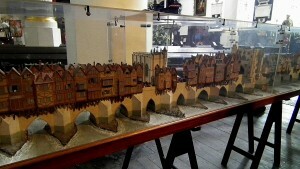 Revenue from the bridge was also used to help fund the building of the new Guildhall in the early 15th century. The first view of London Bridge for travellers approaching from the south may well have been the severed heads of traitors, which were regularly displayed on pikes on top of the gatehouse (enlarge ancient print to view). This tradition started with the head of Scottish freedom fighter William Wallace* in 1305, after being hung, drawn and quartered at Smithfield, and continued for over 350 years. 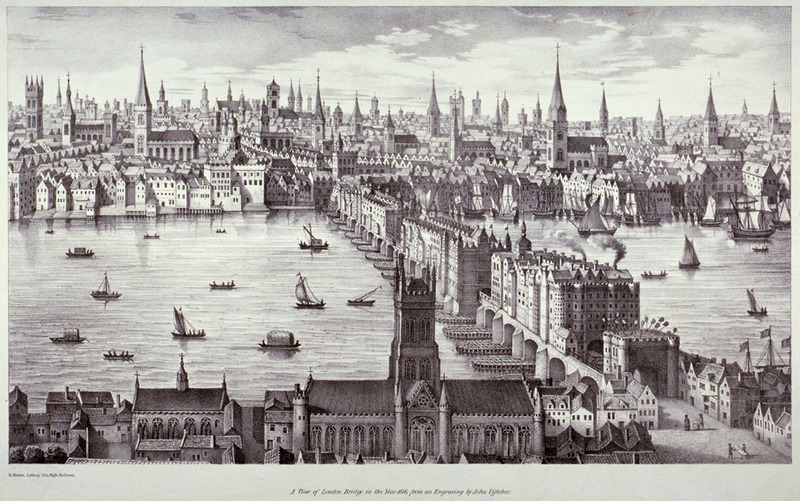 Due to the bridge being the only crossing over the Thames into the City, London Bridge was one of the busiest thoroughfares in medieval London. Many shops sold good quality high priced items that covered the expense of renting on such a prime location. Some tradesmen, such as several mercers and haberdashers, found business on the bridge lucrative enough to move from their historic trading locations in the city. Most of the buildings were four storeys high, allowing many of the traders to live above their shops, and by the mid 14th Century the impressive number of shops and houses crammed onto the bridge was approaching 200. By the late 16th century the bridge was regarded as one of the wonders of the world by foreign visitors, such was the remarkable sight of a ‘little city’ on a bridge. The buildings spanned the width of the bridge, leaving a narrow thoroughfare for horse-drawn carts to navigate through the middle, causing a tunnel effect as they travelled from the darkness under a dwelling, into the daylight of a gap between them. Pedestrians hadto be wary as they made the crossing, dodging horses, cattle and carts as they went. The narrow and hazardous thoroughfare, with people and goods travelling in both directions, was given some order in 1722, when a ‘keep left’ policy was implemented. During the history of the bridge, several water wheels were constructed to utilise the river water for consumers in the city. The most famous was constructed at the northern end of the bridge in 1580, by Dutchman Pieter Moritz. Another famous bridge structure was erected in 1579, Nonsuch House. This elaborately decorated property stood midway between the southern gatehouse and Thomas Chapel. Nonsuch was imported from Holland and assembled without the use of nails, using wooden pegs only, and became quite probably the most recognisable landmark on the bridge. The closely spaced piers affected the flow of the river, the bridge becoming a weir for the water flowing under it. At different stages of the tide the journey by boat under the bridge could at best be perilous, and at worst suicidal, many died ‘Shooting the bridge’ rapids. In severe winters, of which there were many during the bridge’s existence, blocks of ice would collect between the narrow piers, turning the bridge into a dam. The trapped water upstream, as far as Westminster, occasionally froze over. Author James Boswell describes in his journal the wintry scene he viewed from London Bridge in January 1763. The ‘rude and terrible appearance of the river, partly frozen up, partly covered with enormous shoals of floating ice which often crashed into each other’. 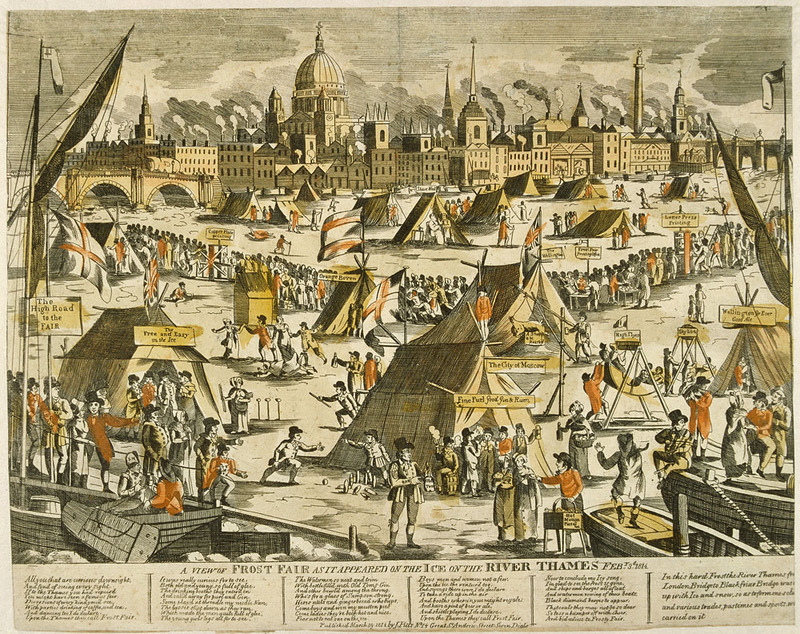 The frozen river gave rise to one of London’s strangest spectacles, frost fairs. Frost Fairs: The first recorded was in 1309, but it was during the severe winters of the 17th and 18th centuries that they were more commonly seen. 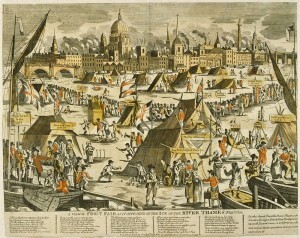 Ice, recorded up to 11 inches thick, during the particularly severe winter of 1683/4, allowed elaborately decorated stalls to be erected on the river Thames, from Temple to Southwark. Sword swallowing, puppet shows, dancing, and even bear baiting, a popular entertainment south of the river on Bankside, were all part of the spectacle. The bridge was redesigned in the early 19th Century to allow water to flow under it more easily, bringing an end to the era of the frost fair, the winter of 1813/14 was the last. It is thought that only around 20% of the river water travelled under the bridge unimpeded, before it was redesigned. The inevitable end for Old London Bridge was hastened by the building of the second river crossing in Central London, Westminster Bridge in 1750. A design for a new London Bridge was agreed, and in 1757 all the buildings on the old structure were removed or demolished. In 1831 the new bridge was completed, and for a brief moment in time the remains of the legendary Old London Bridge stood next to John Rennie’s modern structure, erected 100 feet further West. The building of the Victoria embankment in the 1880’s had an unfortunate effect on Rennie’s bridge. The project entailed reclaiming land from the river, which decreased the width of the Thames and altered the speed and movement of the water. After the bridge was widened, to ease the considerable traffic conjestion on the structure in the early 1900’s,structural engineers discovered the bridge was slowly subsiding. John Rennie’s London bridge was bought by an American oil tycoon in 1968, and rebuilt in Lake Havasu, Arizona, where it remains today. 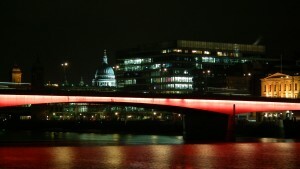 The existing London Bridge was opened by Queen Elizabeth II in 1973. The modern, functional crossing between Southwark and the City of London has inherited one of the world’s most famous titles, but will never eclipse the legend of the first stone London Bridge that stood for over 650 years. *Portrayed as ‘Braveheart’ by Mel Gibson in the 1995 film. Historic Prints Reproduced by Kind Permission of The City of London, London Metropolitan Archives. Copyright © 2019 The London City Guide.